As a blogger, I am often tagged to be LUCKY girl living a good, hassle free life. Little do you know, it was not easy for me to leave my highly paid IT job to become a full-time blogger just to follow my passion. Though I feel satisfied at the end of the day, however, to confess the truth....life as a blogger is more challenging and physically demanding than me as a girl sitting in a/c cabin handling the stats. I deliver to the BEST of my ability irrespective of the challenges that come my way. To help understand blogger's life, I have to face challenges everyday. Being a camera shy person, every photoshoot gives me jitters. I have sleepless nights before the shoots, not knowing how to make the shoot successful. We have to travel long distances for photoshoots, sometimes even a week for theme based campaigns. 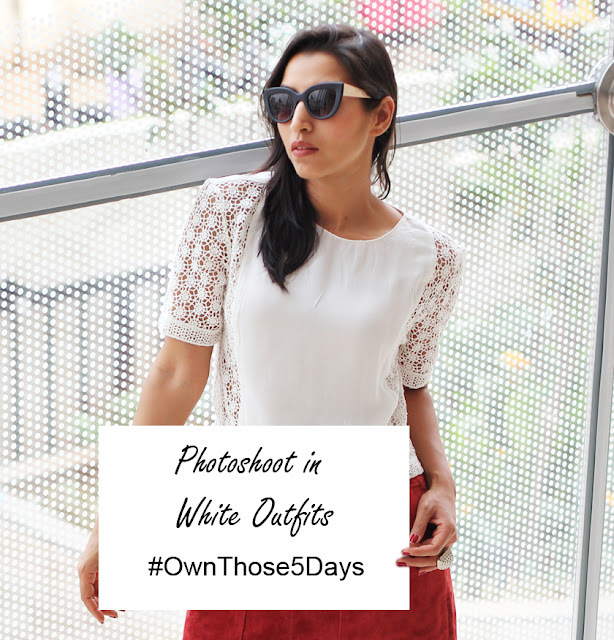 One such campaign tested my patience, since it was an outstation photoshoot and the theme was 'White Spring'. As usual it was a sleepless night and to my horror I found out that I am on my period. Shooting white outfits on periods, travelling long distance without having the convenience of wash rooms on the way, was a challenge. Being a responsible person, I didn't want to let down the crew members and accepted the challenge ONLY trusting Whisper sanitary napkins. With enough Whisper sanitary napkin packets in my handbag, I started the journey with an unstoppable attitude. Though I didn't have the access to washrooms on my long journey, I was amazed that actually I need not change often since it absorbs more and lasts longer. No Spillage, you see !! Though I tuned my mind for an uncomfortable photoshoot, the New Whisper sanitary napkin with top sheet upgrade & boosted core offered more absorption and better dryness for clean feeling. couldn't believe that I literally faced the camera in White outfits even during periods. Now I can follow my passion and #OwnThose5Days with confidence. Watch the stories of women who are unstoppable. Take Control ..... Be UnStoppable ! !